+2 Exam Results were declared in TamilNadu for the HSC (Higher Secondary)Exams held in March 2011. Hosur student Rekha gets state first with 1190 marks. You can see the 12th Exam Results in below websites. The TamilNadu state government has also announced that the 12th Exam marks lists will be distributed on May 25. Students failed in less than three subjects can retake the examination which will be held next month. Application for re-evaluation of 12th exam papers and additional copies of the +2 exam mark sheets will be distributed from May 11 to May 16. 85.9% students got passed in 2011 +2 exams. 1st rank is 1190 marks scored by 'Rekha' from Vijay Vidyalya School, Hosur. She got centum (i-e 200 out of 200) in major 4 subjects (Maths, Physics, Chemistry and Biology) and 195 in language subjects Tamil and English. Rekha's father Kesavan is working as an officer in private concern and her mother malarvizhi is a teaching staff in avalapalli school. 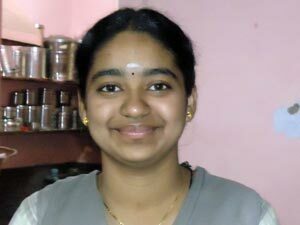 Rekha scored 479 in 10th (SSLC) examinations. Kallakurichi Bharathi Matriculation student Velmurugan topped second in state level with 1187 marks. Four students scored 1186 shared the 3rd place. Find below their names. Find below the Photo of State First student Rekha with her Parents. Pass percentage in Corporation Schools grew marginally by 1.6 per cent. Maduvankarai corporation school student Premkumar is the Topper among Corporation School Students. He says he got inspired to get the Top rank as his Mother used to work hard daily for selling fish to run the family. Read my another post to know about the Walk-in Interview for the latest job openings in QualityPoint Technologies. very nice blog with interesting and useful information. nice work keep it up! !